Fairfax Financial is BlackBerry's white knight. Well, that didn't take long. BlackBerry plans to become a private company in a deal that is worth just $4.7 billion. BlackBerry's largest shareholder, Canadian insurance company Fairfax Financial, hopes to buy the smartphone maker for $9 per share. That's an extremely low premium for a once-dominant company. Prior to the announcement on Monday, BlackBerry was trading at $8.24 per share. As recently as Friday, BlackBerry shares were trading at more than $10. But shareholders were skeptical that Fairfax's deal could even go through: Shares of BlackBerry (BBRY) traded slightly below the amount that Fairfax was offering on Monday. The proposed deal comes just three days after BlackBerry announced a brutal preliminary quarterly financial report, including a $1 billion loss for last quarter and plans to lay off about 4,500 staffers. And so Fairfax, which already owns about a 10% stake in BlackBerry, is a possible white knight for a company that sorely needs one. Fairfax CEO Prem Watsa said the deal "will open an exciting new private chapter for BlackBerry," and that it will "deliver immediate value to shareholders." The Fairfax offer isn't a done deal, however. BlackBerry chairwoman Barbara Stymiest said the company would consider "superior" deals, and the company has until Nov. 4 to find a better offer before proposing Fairfax's plan to shareholders. 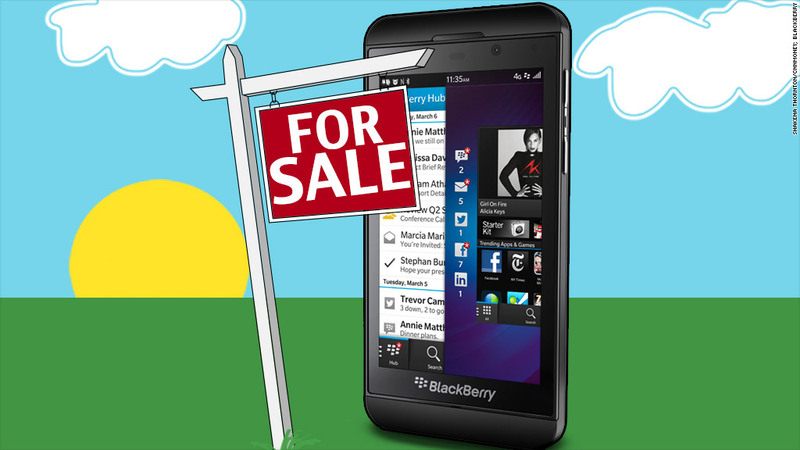 If BlackBerry does receive multiple offers, a bidding war could break out. Late Friday, the New York Times posted a report saying BlackBerry co-founder and former co-CEO Mike Lazaridis had approached private-equity firms about making an offer for the company. If the Fairfax deal goes through, it will likely be a big relief for BlackBerry -- and a big challenge for Fairfax. BlackBerry said on Friday that it would give up on consumers and redouble its efforts on winning over corporate customers -- a sentiment that Watsa echoed on Monday. But BlackBerry has recently struggled in corporate market too. Companies have been increasingly willing to let employees work on phones they choose -- a phenomenon known as Bring Your Own Device. Those employees are overwhelmingly selecting iPhones and Android smartphones. Meanwhile, BlackBerry rivals Apple (AAPL), Google (GOOG) and Microsoft (MSFT) have worked hard to improve their security and e-mail delivery capabilities. As a result, corporate IT departments have opened their once-restrictive gates to non-BlackBerry devices.